New app from our NIV app series with Hodder – read or listen everyday to the bible and in just year you will have done it all! There has never been an easier way to read the Bible in one year. Now, with the NIV Bible in One Year app from Hodder & Stoughton, you can both read it and listen to it on the move via your iOS device. 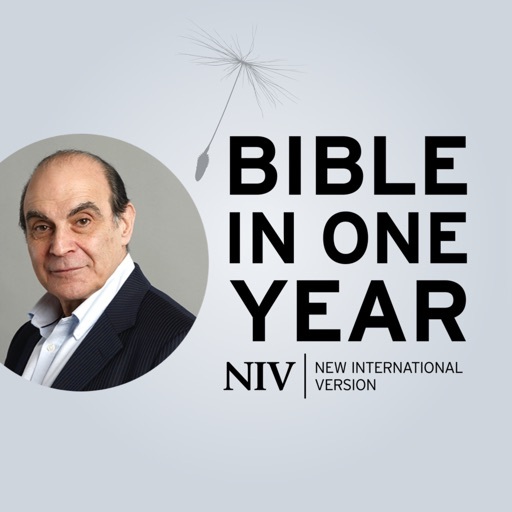 The NIV Audio Bible in One Year app includes the full text of the NIV Bible (British Text) and the award-winning audio narration by British actor, David Suchet. The Bible text is arranged into 365 manageable daily readings. Each day includes portions from the Psalms or Proverbs, and New and Old Testaments. The app also includes a journalling feature in which you can make notes next to the text as you study and bookmark your favourite passages for easy reference. The app also allows you to share notes and Bible verses with friends and family or yourself by SMS (text), email, Twitter and Facebook. INSTALL NOTE: The price of this app includes the full 80 hours of audio for the NIV Bible read by David Suchet (which amounts to 1.3GB) but it does not automatically download when you purchase the app. Users can download each month’s audio content from within the app to suit their storage limitations. - Listen to British actor David Suchet read his award-winning recording as you read the Bible in One Year or while multitasking. - Download all the audio at once, or one month at a time, depending on the space available on your device. - Use the Sleep Timer to play the audio for a set number of minutes. - The NIV Bible in One Year app is available on all iOS devices. - The app will automatically open on today’s reading. - Switch off ‘Always show today’s reading’ in the Settings menu. - Simple navigation: select any day of the year via ‘Find a Day’ in the main menu, or the scroller menu at the top of the screen. - Make notes next to the text as you study the Bible in One Year. This Anglicised NIV Bible in One Year app has been developed in the UK by Aimer Media in collaboration with Hodder & Stoughton. Due to the terms of Hodder’s NIV license, the app cannot be purchased in the USA or Canada. We apologise for any inconvenience this may cause. - Fixed bug where 'My last reading' option loaded a different reading.